Area rugs are a great way to update a room's design without spending a lot of money. You can install an area rug on top of any type of flooring and, with the wide variety of designs available, you're sure to find one that's just the right fit for your home and budget. Kermans flooring store in Indianapolis got our start with area rugs and they remain one of our most popular floor coverings. Read our five tips on adding an area rug. If you place an area rug in the middle of a large space with no furniture touching it, it will float in the room and look small or out of place. When installing an area rug - in any size room - make sure at least the front two legs of the furniture are touching the rug. Doing so will ground the area rug and allow it to tie your room together. Sometimes you want a smaller rug to accent a space. Other times you want a large area rug that becomes the dominant floor of the room. Sizing a large area rug can be tricky - too big and it looks like poorly measured carpet, too small and it just looks odd. Rule of thumb: measure the room and subtract two-three feet from each side. 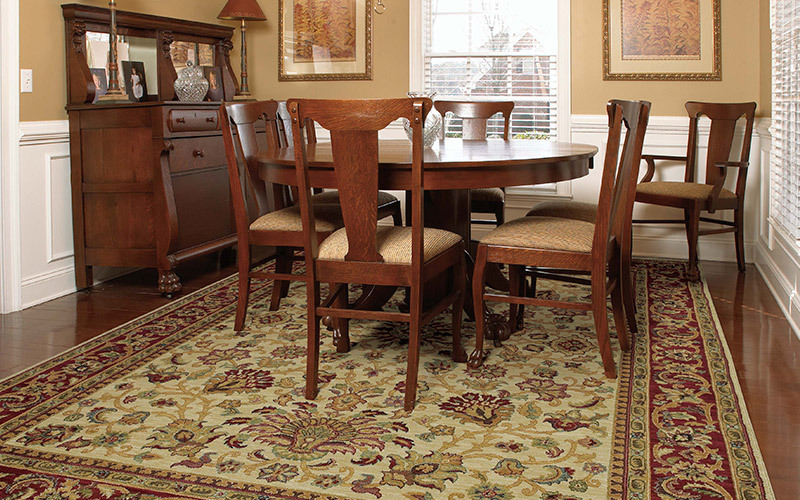 If you have a large or oddly shaped room, you may not be able to find a standard area rug that really fits your space. In this case, take a look at carpet and have it cut down to just the right size. 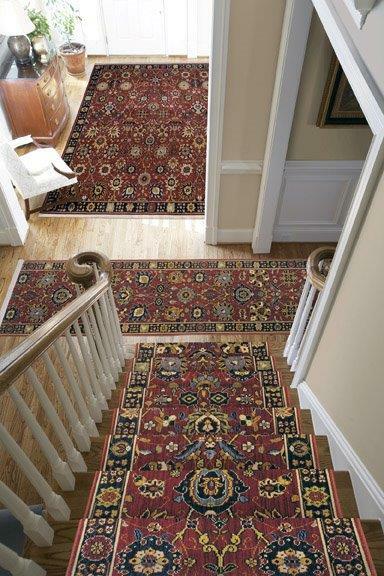 We can take any style carpet and create a custom area rug that is exactly the right dimensions. >Learn more about area rugs. Layers are a big design trend right now in home decor and there's no reason you can't work that trend into your flooring! You can layer a patterned rug on top of a solid carpet. Or layer two complimentary colored rugs on top of each other for added depth. Layering with area rugs can be a lot of fun and a great way to really update the look of your room. The thickness of area rugs varies based on the yarn and style of the rug. For example, a wool rug will feel thick and luxurious underfoot while a natural fiber rug will feel a bit thinner and stiffer. No matter which type of rug you select, the padding underneath will make a huge difference in how well the rug stands up to traffic, how it feels underfoot and help eliminate rug slippage. Be sure to take the time to select the right padding and you'll be happier with your area rug for years to come. You can find an area rug in solid colors as well as a wide variety of patterns: animal print, rustic, oriental, flowers, geometric shapes... the list is practically endless. Take a look at the overall design of your room and consider how the area rug fits in. Whether you need a little more color or are looking for a solid color to tie elements together, there's an area rug design that fits the bill. Wondering how you can make these design tips work for you? Our free design consultants are ready to help. Schedule an appointment and we'll have samples and ideas ready as soon as you walk through our doors.